This article will go over how to change the settings for your Accounting tab. The settings that are affected by this bubble are the settings for creating the invoice. 1. 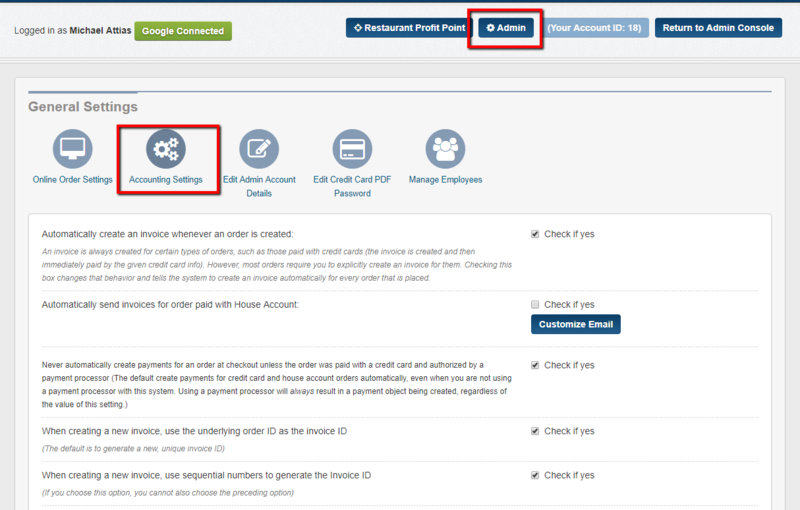 To review your invoice settings click on the Admin tab and then Accounting Settings bubble. A screen will appear with your default settings. 2 - Automatically create an invoice whenever an order is created. (default to yes) Once an order has been placed then CaterZen will automatically create an invoice for the order under the Accounting tab. 3 - Automatically send invoices for order paid with House Account. (default to no) If you have your house account payment option turned on, you can now have an invoice automatically emailed to your client. You can choose if you want the invoice to be emailed the day of the order or the day after the order, what time you want the invoice to be emailed and you can customize the email message. 4 - Never automatically create payments for an order at checkout unless the order was paid with a credit card and authorized by a payment processor. (default to yes) You can tell the system to assume that all credit cards have been paid or you can tell the system to wait till you add the payment for credit card. If you want the system to assume that credit card has gone through then uncheck the yes box. 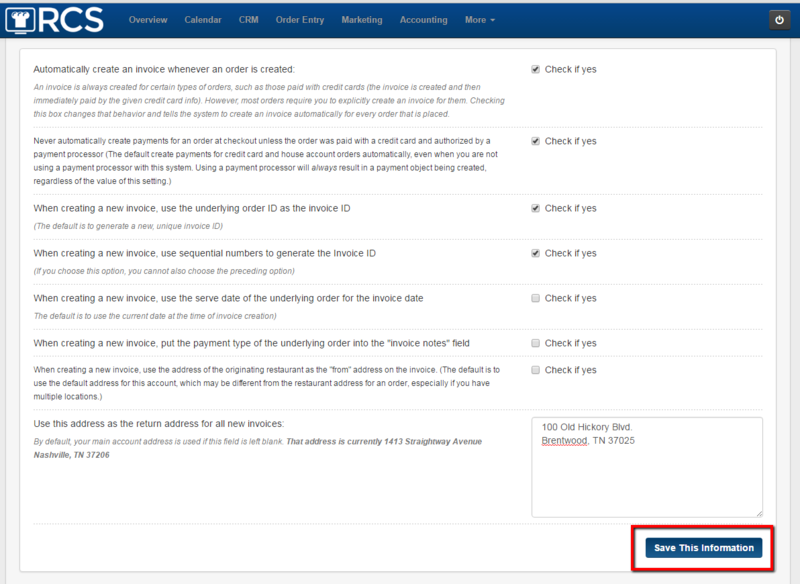 If you want to apply the payment to the order for the credit card then check off the yes box. 5 - When creating a new invoice, use the underlying order ID as the invoice ID. (default to yes) If you want the Order Id number to match the Invoice number then check yes. 8 - When creating a new invoice, put the payment type of the underlying order into the "invoice notes" field. (default to yes) If you want the payment type that customer plans to pay with to show on the invoice then check yes. 9 - When creating a new invoice, use the address of the originating restaurant as the "from" address on the invoice. (default to no) If you have more then one location then the first location listed under the Restaurant Location Section is your default location. The return address for your invoices will show the default location's address. If you want the address for the location that the order was create under the you will need to check this box off. 10 - Use this address as the return address for all new invoices. The default is having the address you have for your location to appear on your invoices. If you need the customer's payment to be sent to a different address please list it here. 11. To add a customer message to your invoice that will appear on all invoices please add here. If you want to add a Terms & Agreement to always show on your invoice you can do so here. Note that you can change the information while in the invoice as well if it needs to be customize. Please remember to check the YES check box for the message to appear. 12. PLEASE do not forget to hit SAVE after any changes you make.